Video stills of three HIV enzymes are among the 2016 Winners of FASEB's BioArt Competition. The stills are from a molecular animation created by Maria Voigt and David Goodsell that illustrates A Molecular View of HIV Therapy. These images model the molecular structures of three enzymes with critical roles in the life cycle of the human immunodeficiency virus (HIV). At the top, reverse transcriptase (orange) creates a DNA copy (yellow) of the virus's RNA genome (blue). 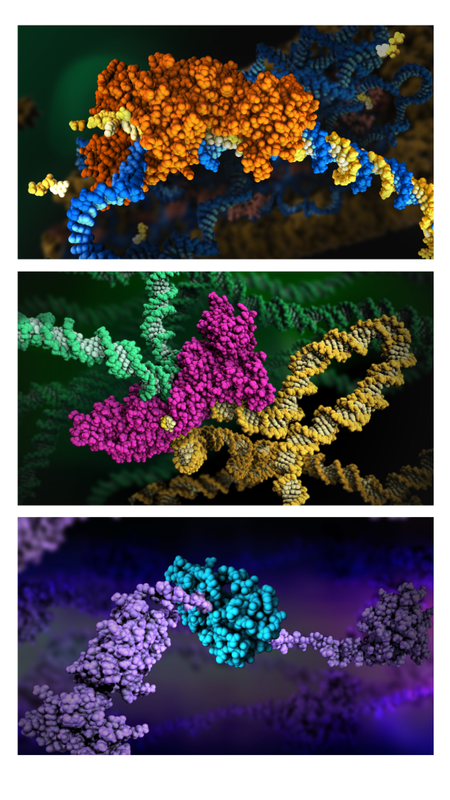 In the middle image, integrase (magenta) inserts this DNA copy in the DNA genome (green) of the infected cell. At the bottom, much later in the viral life cycle, protease (turquoise) chops up a chain of HIV structural protein (purple) to generate the building blocks for making new viruses. Visit the animation to see them in action.